While you would normally share our little wonderworld with approx. 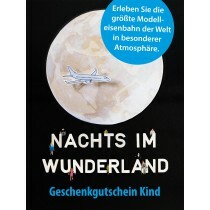 1000 other visitors at ordinary opening times, 'Wunderland at night' offers you a visit in an exclusive group of only 300. This offers you the possibility to explore the Wunderland comfortably and unhurried without any waiting times nor big crowds. Starting at 7.15pm you will get in the mood for your visit with a welcome drink and a brief speech dealing with the Wunderland's history. Afterwards you can take a stroll through the exhibition. Our staff members will be delighted to answer all your questions and will take you on short guided tours behind the scenes. An exclusive Wunderland night from 7.15pm until 11.00pm without any waiting times and a lot comfort. Adults EUR 22.90 Children EUR 15.90 (15 and under) For our exclusive events we offer no further discounts.